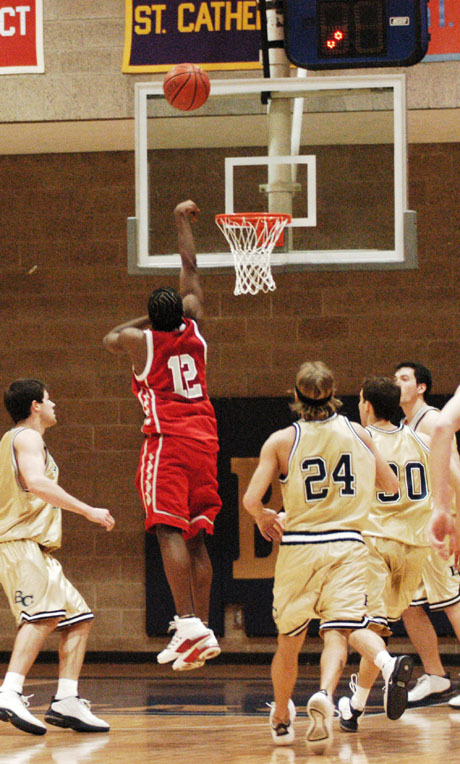 Jerome Williams (12) hits the game-winning 3-pointer as time expired against Bethel on February 1, 2003. While our official start is in late 2009 the first games we published on the software platform that would become d3photography.com were between St. Kate's and Gustavus and then Hamline and Bethel on February 1, 2003. We owe a special thanks to the MIAC's Dan McKane for giving Ryan a ride from St Kate's to Bethel for the second game. One of those first photos can be seen to the right. We covered our first Stagg Bowl in December, 2003, and then our first Final Four in March, 2004. Since then we have attended every single Stagg Bowl, men's basketball championship, nearly every women's basketball championship and, for the last decade or so, every single baseball and men's and women's hockey championships as well as every cross country, indoor track and outdoor track championship since 2016. And we started covering wrestling and swimming and diving in 2017.